When confronted with signs of dementia or other cognitive impairments in a new client, what are the proper steps that an attorney should take when forming a client-lawyer relationship? The Model Rules of Professional Conduct require attorneys to maintain a normal client-lawyer relationship with a client with diminished capacity. However, a lawyer’s actions may be called into question if a transaction is later challenged and certain precautions were not taken by the lawyer. A client with diminished capacity is more vulnerable to threats, fraud, undue influence, and manipulation. What protective actions can an attorney make to help minimize the risk that the client will be taken advantage of? 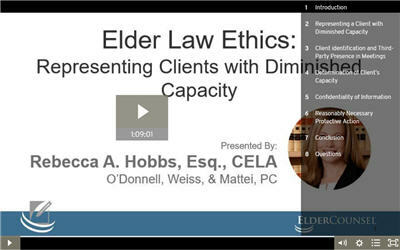 Watch Rebecca A. Hobbs, a Certified Elder Law Attorney and ElderCounsel member, discuss ethical dilemmas that elder law attorneys face every day when representing clients with diminished capacity and learn about protective measures an attorney can take to help limit their client’s vulnerability. Pre-approved: AL, AR, CA, CO, FL, IL, MO, NH, NC, NH, NJ, NY, OH, PA, TX. Pending: GA, WI. Attorney will self apply in states not listed.